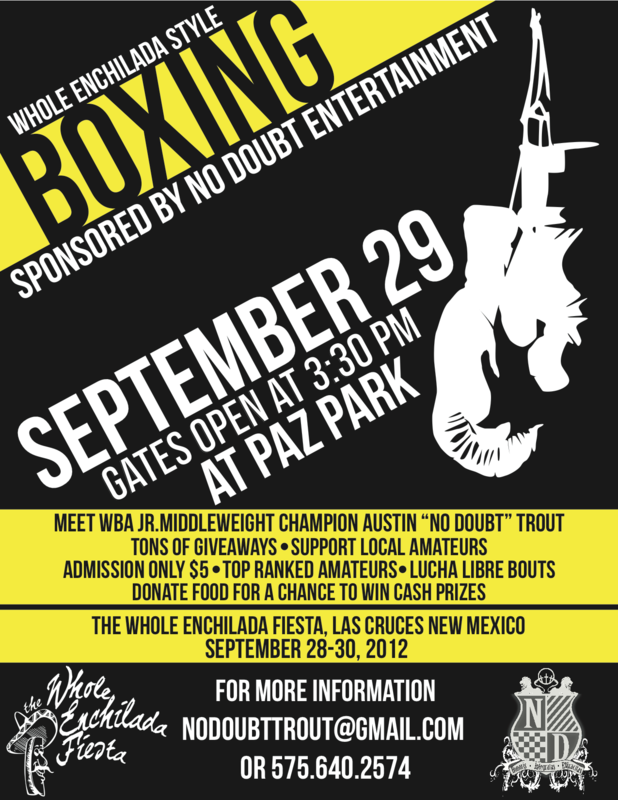 Thanks to WBA Super Welterweight champion Austin Trout and his promotion No Doubt Entertainment, boxing will be making it’s return to the 32nd annual The Whole Enchilada Festival this September weekend, in Las Cruces, New Mexico. A total of 18 scheduled amateur matches are tenatively set to take place Saturday September 29th at the Paz Park baseball fields, with the first bout starting at 4pm. The main event will feature 11-time national champion and by far New Mexico’s best amateur boxer, Ayanna Vasquez.The Whole Enchilada is one of the most attended events in the state of New Mexico, drawing more than 40,000 visitors over it’s three-day festivities. Concerts, games and events are held during the event. This will be the first time in eight years that boxing will be part of the event. “We hope to make boxing a yearly event. We’re also looking to have multiple days of boxing,” says No Doubt Entertainment Coordinating assistant and Trout’s fiancée Taylor Hardardt. Weigh-ins for the matches which are not open to the public, will take place Saturday from 07:30am-9:00am at the Bevery Hills Hall. Later that day, photo-op face off between the competitors will take place at 1pm on the Roberto’s Stage. The event will also have something special for professional wrestling fans as a lucha libre match is also set to take place.